Living soil is all about diversity. Diversity of fungi, bacteria, protozoa, nematodes, arthropods, and earthworms breaking down organic matter that produces nutrients for plants to use. Who knew it was all of those things that makes a soil healthy…a living soil! 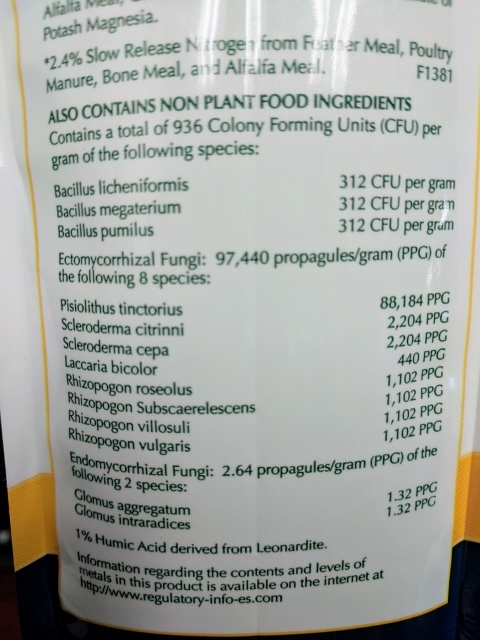 Have you seen on the packages of Espoma or other brands that says it contains Mycorrhizae or Bacillus? Mycorrhizae is “a fungus that grows in association with the roots of a plant in a symbiotic or mildly pathogenic relationship”. Imagine a network of fungi that connects plants to one another. Think of their relationship as mutually beneficial. Plants feed the Mycorrhizae and Mycorrhizae help feed the plants. Untamed Science has an article that goes into more depth on Mycorrhizae if you really want to dive into their relationship. Have you heard of how plants have their own internet and can talk to each other? Read about it here from the BBC. The three different kinds of Bacillus contained in this label on the right all have their own roles in the nutrient uptake of a plant. For example Bacillus megaterium is a phosphate solubilizing bacteria (PSB). As the name suggests it helps the nutrient phosphate become available for a plant to take it up through it’s roots. Others are nitrogen solubilizing bacteria and again some are potassium solubilizing bacteria. Bacillus and Mycorrhizae will improve the growth of the plant, its nutrient uptake capabilities, and boost its immunity to disease. That’s pretty cool! 1. When you plant a new plant into the ground use a fertilizer that contains these Bacillus and Myccorrhizae (Ectomycorrhizal Fungi – as seen on the label above). This will help build those highways of networking fungi and bacteria to boost your plants nutrient uptake. 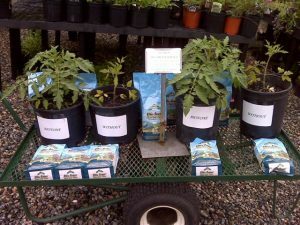 See the second image down of the tomatoes grow with and without Biotone. Incredible difference! 2. Try practicing a low till method of gardening. No-till farming as become a conservation effort for soil and water and low till or no-till gardening experience has shown that tilling the ground can interrupt these networks of fungi beneficial to our plants. If you add organic compost or manure on-top of your soil instead of tilling it in, it will slowly add the nutrients your soil needs. Less hard-work digging up dirt and better for the soil! Win win! You may need to use tilling to break up compacted sod when converting soil for a garden but even then if you lay a thick layer of compost over the sod or try the “black-out” method of covering the sod with newspaper, cardboard, or whatever blocks the sun out until it dies, then putting dirt on top, has worked just fine! 3. No bare soil! Keep your soil covered with mulch or a living ground cover. If you have dried grass clippings, use that! If you have leaves, use that! Any mulch will help reduce evaporation of water (less watering, yah! 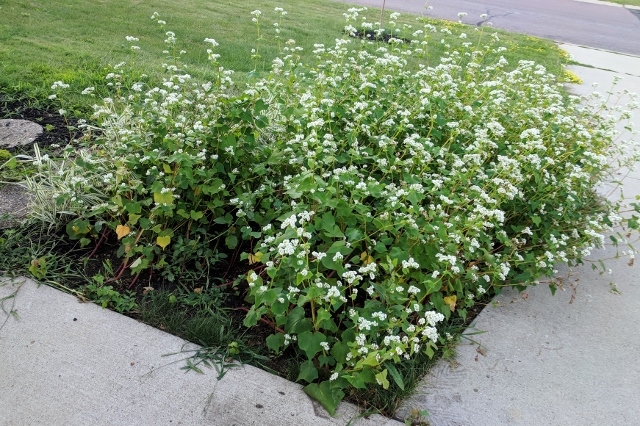 ), stop weeds from growing, and add nutrients to your soil over time as it breaks down. Another method to cover your soil is planting a cover crop or ground cover to stop weeds and to feed the soil! Some examples are hairy vetch, oat, field pea, and buckwheat. See the buckwheat cover crop on the image to the right. This piece of soil was very nutrient deficient and need a nitrogen fixating plant ( meaning the plant actually puts nitrogen into the soil!). The blooms were great for pollinators also! 4. In line with cover crops or ground covers making your own green manure is great for the soil. When you grow a cover crop you can leave the uprooted or sown crop to die once winter hits and leave it there til Spring and lightly work into the soil or use as a natural mulch. 5. Keep that soil aerated. Try to keep permanent paths to walk on in-between your crop rows. This prevents the soil around your plants from compacting and interrupting the proper water and oxygen balance the soil needs to grow vigorous, healthy plants. Just like us, we need water and oxygen and when a soil gets compacted it doesn’t hold the correct percentage (25% of each) of water and oxygen for healthy plants. The compost you added to your soil is also going to help aeration because it adds non-compacted organic matter and brings in earthworms who really help aerate soil. If you don’t see earthworms you know you don’t have enough delicious organic matter for them to eat. Add compost, manure, and you can even buy earthworms! Soil is the most important part of our gardening efforts and understanding what it needs will help grow vigorous, healthy, and productive plants. Researchers and universities are finding new ways to promote living soil and increasing sustainability to farming practices. This year Gustavus Nobel Conference 54 topic is called “Living Soil“. It will be interesting to listen to how soil is a living entity that isn’t just something we dig up and walk on.